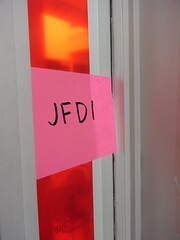 We are all familiar with "JDI" - "Just DO It", sometimes strengthened to JFDI. It is a useful reminder to avoid prevarication and over analysis. Just Do It, And Learn. The problem with JDI is that It often doesn't work first time. But if you J-DIAL, you quickly iterate to a smart solution.